We were told that within a week Hailey would be having her pacemaker placed in Salt Lake City, Utah at Primary Children's. Prior to the pacemaker we all agreed that Hailey should probably get an MRI done. It's been 2 years since her last and to have an MRI done AFTER a pacemaker would have its complications. So we would leave on Sunday, take our time getting to Salt Lake and spend the night. We spent the night in Salt Lake and Monday morning we would be checking into the Ronald Mcdonald House which is just a short distance from the hospital. They have a whole new Ronald McDonald House which is amazing! So spacious and comfortable. (more on the RMHC later) We would also head to the airport to pick Josh's mom up who would be accompanying us during the hospital stay and recovery. We picked up Grandma, got settled in, and the next morning would be Hailey's appointment for her MRI. I never get a good nights sleep before any procedure and I never have an appetite either. I'm pretty much a nervous wreak and this is only the MRI! Hailey was in such a good mood the morning of the MRI. She didn't know what was going to happen. She knew we were going to the hospital and that she was going to see Doctors. I told her that at the hospital there was going to be nap time but when she woke up from her "Nap" mom and dad and Grandma would be waiting for her. Before we left I took Hailey for some "Us" time in the Ronald McDonald house library where we found the cutest spot to sit and read. It was called Eliza's Library. You can read about Eliza's Wish HERE. Eliza was a little girl with Metachromatic Leukodystrophy and she loved books. You very rarely ever even hear the word Leukodystrophy but because of Eliza's wish and library so many more people will learn about it. #Amazing! We got to the hospital and had to change Hailey in to her hospital gown and go through pre-op. Hailey had to be put under general anesthesia for her MRI. Usually they can just sedate a child but with Hailey having heart issues they needed a Cardiac Anesthesiologist in case something went wrong they could take care of it then and there and not have to call a code and wait for a team to come in. With general anesthesia she would already be intubated. When they were ready for Hailey they asked her what flavor she wanted her "special mask" to smell of. She tried all kinds and in the end said she didn't even want a special mask. Poor thing. I could tell she's starting to get nervous. When it was time to put her under they said we could be with her until she is asleep. She fought the gas mask and started crying and we kept telling her it'll be over fast and that we loved her. We kissed her and she was asleep. Her body started twitching and the look on my face caused the doctor to have to explain her body twitching was not abnormal. He said that they'd be done in about an hour and then we'd see her in recovery. Hailey just wanted to snuggle her dad while the nurses did what they needed to and take their notes and watch Hailey's numbers. We were in recovery for a LONG time! Each time I posted on Hailey's Facebook page she'd get so many well wishes and comments. I showed her all of them and she said she wanted to see all her friends. I gave her my phone and she was so happy to see all the faces that left comments. The nurse ended up telling us that there was no way that she'd feel comfortable discharging us with Hailey's heart rate so low. She called Hailey's surgeon that would be placing the pacemaker to let him know what was going on and since we had to be back in 12 hours for her surgery she wanted to know if he wanted to admit her and he did. He ended up coming in and talking to us and I was kind of thrown for a loop. Hailey's surgeon is a different person from her cardiologist who we've known for a couple years now. When I talk to the cardiologist about the pacemaker she made me feel like this was such an easy surgery to happen. She said Hailey will be in a cath lab and we place the pace maker and and she'll be good to go after 24 hours. Then I talk to the surgeon....kind of a different story. Maybe it's the same story just told with more detail. I was kinda shocked. I didn't hear anything about threading leads through her groin or screwing anything to the walls of her heart when I talked to the cardiologist!! It's too late to turn back now though. The surgeon was great though. He answered all my questions and calmed my worries to an extent. Surgery would be at 8 am the next morning. 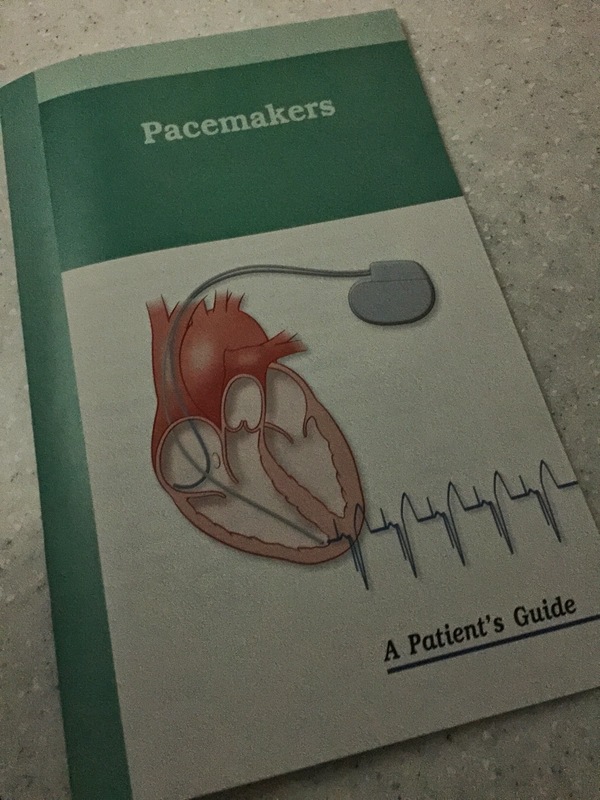 They gave me a "pamphlet" that was more like a short novel on What to expect when getting a pacemaker. I didn't like reading it but they told me to read the book and to NOT google it. That night Hailey slept well even thought her monitors went off approximately every 3 minutes, until I told them that we all know her heart isn't going to be normally and they needed to adjust the monitors. I think I got a total of 3 hours of sleep that night. The morning came fast and it was almost time for the surgery. Hailey asked for an Elsa braid and her and Lambie, we were ready for what the day had in store for us. So I thought. We were all able to go to the cath lab with Hailey and she started crying again saying she didn't want another nap at the hospital. The nurse saw Hailey getting a bit anxious and told the doctor to give her a little something to calm her. We gave hugs and kisses and they rolled her into the cath lab. The tech told us that they would page us with updates and give us a pager. I gave it straight to Josh to have him be in charge of it. The tech told us to try to go relax, or go eat, that we'd probably hear from her when Hailey's was close to being done. I decided I needed a shower. They just recently opened a mini Ronald McDonald House at the hospital. It is truly a great place to have access to. They have showers and they provide the towels and anything you need from soap, to toothpaste, to shaving cream and razors. They also have napping rooms. You can sign up for a room to take a nap in while your child is in surgery and it's a bed that's is quiet and dark. They also have a full chef's kitchen that has a pantry with things for you to cook so you can have a hot meal without having to spend money in the cafeteria. They have computers for you to email or you can just sit by the fire and watch tv. At the 3 hour mark I assumed they would be paging us to tell us it's nearly over. The pager didn't go off but my phone rang. It was the tech. She said that Hailey is fine but her veins are spasming to the point that they can not thread the leads. She said the plan is to first wait. Giving the veins some time to stop with the spasms and then proceed. If that doesn't work they will try medication. If that doesn't work they have to start over again on her left groin. She then said it'll be another 3 or so hours depending on the veins. UGH! I couldn't catch my breath! What happened? This is suppose to be easy. They never told me this might happen! So we just have to sit and wait...It felt like forever. Finally we get another call. They threaded the vein. They just had to wait it out. It'll only be another couple hours. We wait and wait and then another call. It's done. Hailey is doing great! We can come see her in recovery. I thought she'd be super out of it but she was pretty awake and cognitive. She was looking around and naming the pictures painted on the ceiling tiles. A 3 1/2 hour surgery turned into 6 hours! I've never been so happy to see this cute face! I think she's giving me stink eye! At the Ronald Family Room they try to get people to donate dinner every night so parents have a hot meal. This night there was no volunteers. No dinner for the families that were there with their sick children. Josh's mom took dinner on all by herself. She made spaghetti for the whole Ronald Family room that night complete with dessert, brownies. She even purchased some chicken and sweet potatoes and had those available. Josh stayed with Hailey while I ate and then we switched. That night the doctor assured me that Hailey's alarms wouldn't go off and that I should get some sleep. Grandma Brenda stayed with Hailey and Josh and I went down the street to the Ronald McDonald House to sleep. I don't even remember falling asleep but I slept the whole night. We had our alarms set to wake up and get at the hospital by 7. I know that 's when the nurses switch and then the doctors do rounds shortly after and I wanted to be there for that. It was SO COLD that morning. It think the high was 19 with snow on the ground. This desert rat was freezing. I couldn't even take a photo without shivering! I really wanted to get a photo of the difference in the monitors for Hailey before and after surgery. Before surgery she was in the 40s - 50's. 40 to 50 beats per minute The doctors told us Hailey was in Complete Heart Block. Hailey will always be pacemaker dependent. They also told us that instead of Hailey having a pacemaker set for 1 chamber of her heart she has a dual chamber pacemaker where one lead is in her upper heart chamber and one is in her lower heart chamber. She really couldn't have waited any longer for this surgery. 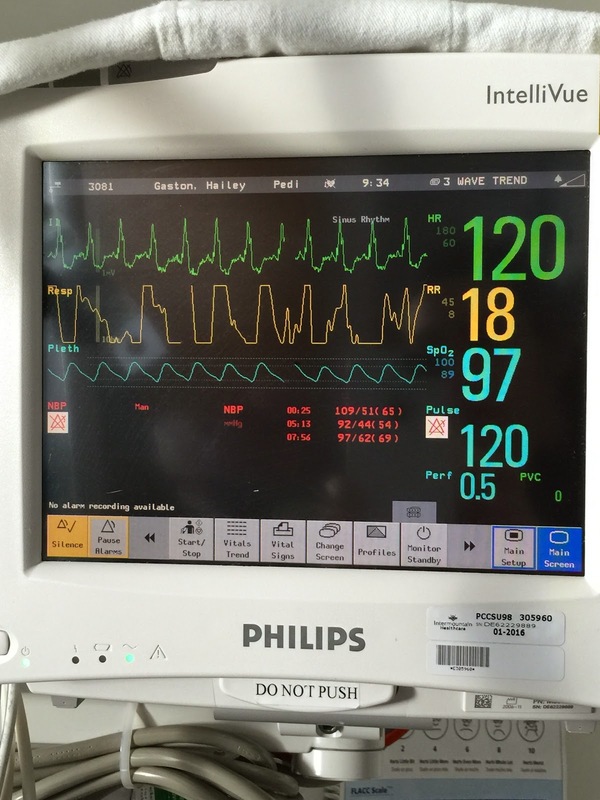 After the surgery her heart was beating at 120 beats per minute. They will adjust the pacemaker next month and put it in power saver mode? I'll let you know when I know what that is. We had a few things we wanted to do. 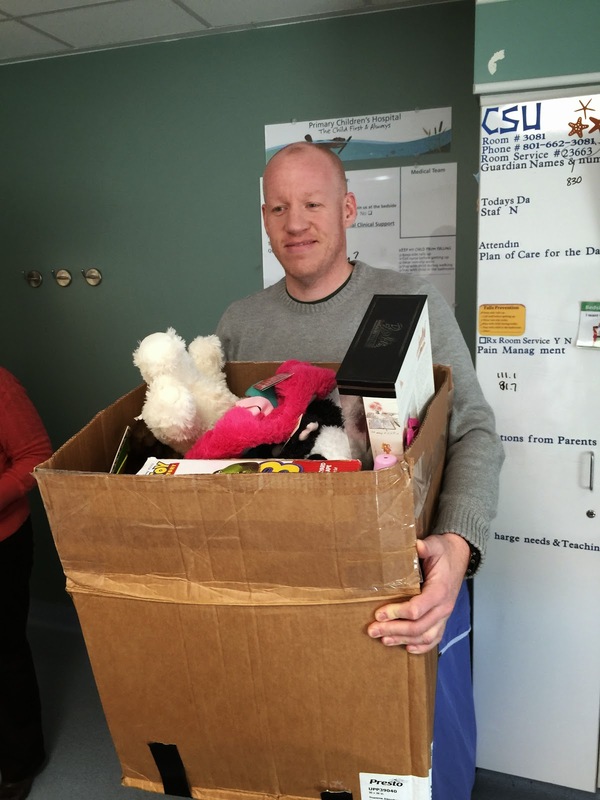 1 thing was collect toys to be donated to the hospital so that other children could benefit. This was a fun project and Hailey loved helping with it. She would see a toy in the donation box and tell me it was for a friend she didn't know yet. I called the hospital rep and she came up and thought it would just be a small box of toys but it was way to heavy for her to carry so we asked Josh to carry it for her. Hailey was so happy she was going to be helping kids by giving them toys. It was pretty funny that as soon as we donated these toys someone comes in and gives Hailey a new #Barbie doll. We were going to be there the whole day so they put music therapy on Hailey's to do list. This is Hailey's absolute favorite thing to do while at the hospital. The fact the guitarist remembered Hailey was a huge plus, but the fact that they all sang FROZEN songs was the BEST thing ever!! The video is on Hailey's Facebook page if you haven't seen it. I love watching it! The hospital rep came back with a Thank you note for Hailey for donating toys. It was very nice to get the note. The whole day and night went well. No alarms, Hailey had to get some IV antibiotics, we were loaded up with wound care supplies and they were ready to send us on our way back to The Ronald McDonald House. 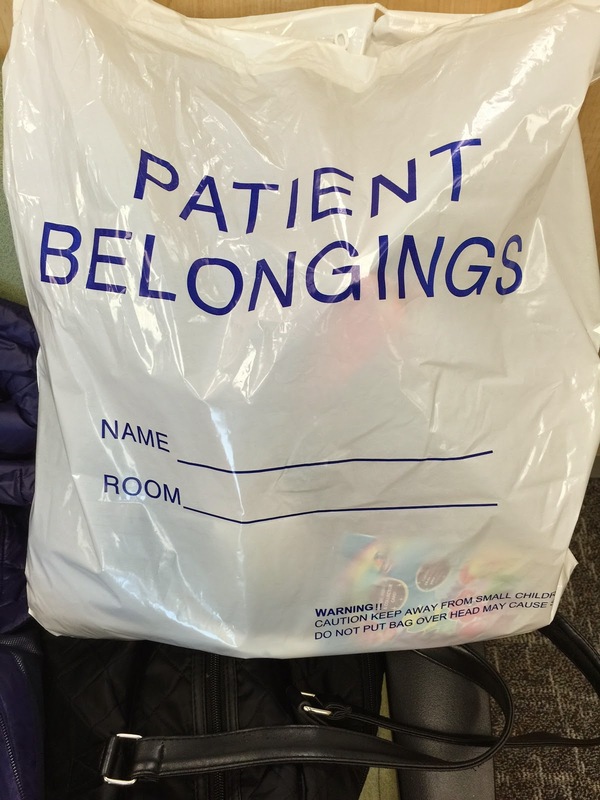 The nurses and the staff are always so great! There are plenty of things to do at Ronald House. Hailey played #Starfall quite a bit. There were people to talk to, laundry to do, and food to eat. 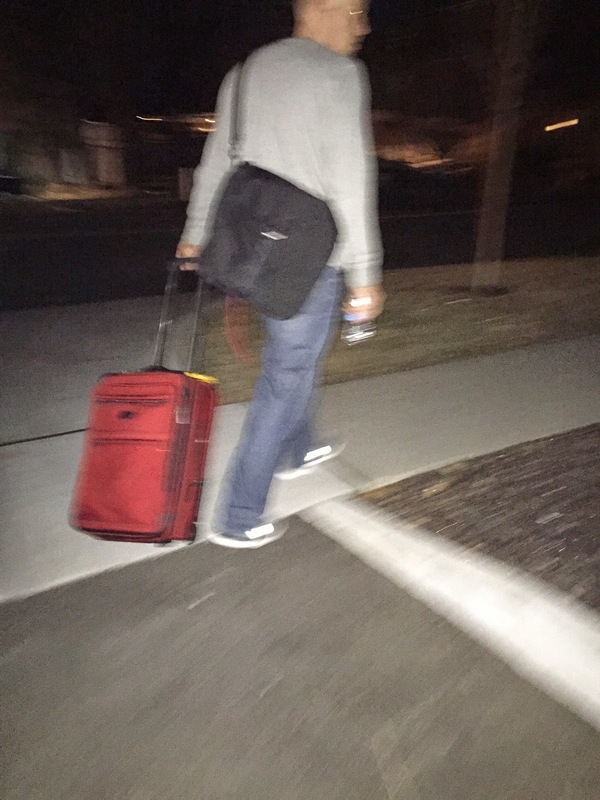 We figured as long as we got the all clear that we would head back to Las Vegas the next day. I've talked before about ways to help the Ronald McDonald House. One being POP tops! Josh's parents have a drop box at their store for pop tops and while at #RMHC we had the perfect opportunity to drop a gallon sized ziplock bag FULL of pop tops! So easy to do! 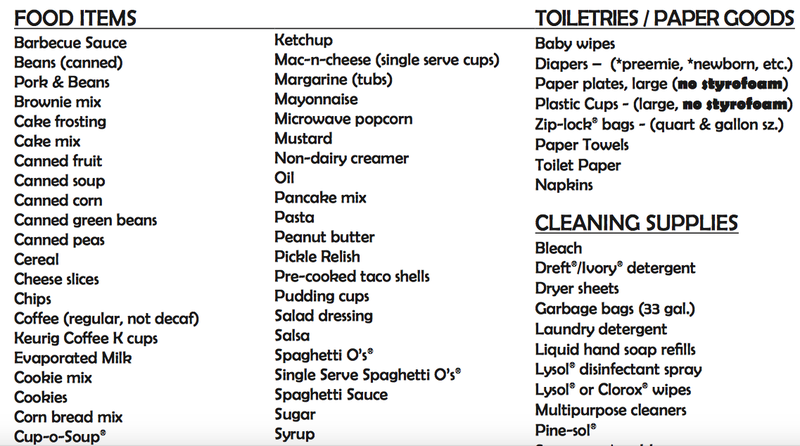 The next time you are at the supermarket or Sam's Club, or Costco pick up some items that RMHC needs. It's very easy and it's GREATLY appreciated! The Ronald McDonald House was our home while we were in Salt Lake During Hailey's hospital stay. They never demanded money from us, they helped everywhere they could, they fed us, gave clean beds to sleep on and hot water for showers. It's an amazing organization that is run on donations. Please help if you can. Other then constantly being cold, I really like Salt Lake City, but I was ready to be home. Be in our house, in my bed, with my dogs. I was starting to feel anxious. I never want to hide anything, going through this was hard. I was worried for Hailey and I didn't want her to ever be in pain or discomfort, but there was also nothing I could do to stop that from happening. I wanted to stick to the rules. Hailey can't lift her elbow above her shoulder, no pushing or pulling on her left arm. If I wasn't there to stop her from doing those things I'd get upset at anyone who didn't catch her when I wasn't there. Even going to the restroom gave me anxiety. I keep thinking, "no one can care for her exactly like I can." I know I always do the absolute best. I was stressed and you could see it in how I was acting. I always had tears in my eyes ready to flow. Josh and I weren't agreeing on everything and if I told Hailey not to lift her arm up he'd shut me down by telling me that what she was doing was fine, it didn't go up all the way. I'm being too over protective. I wasn't going to win if I started a fight because I believed I was in the right and he believed he was right. There were times where it was just too much to handle and I felt like a needed to get away just to cry. I didn't want Hailey seeing me cry but I didn't want to leave her with Josh in case she wanted me. I was down at the kitchen in the Ronald House and someone asked me how I was. Just in general. I don't think she really wanted an answer, she was just being polite. Who knew that her, "Hi! How are you tonight?" would turn into me SOBBING about feeling sad and anxious, and confused and I felt alone. I was hoping that when I got home I'd feel better. I didn't. The anxiety wouldn't go away. I've never cared for a child with a pacemaker before. What if I mess up? Cleaning her wound was not something I wanted to do even though I knew I must. Josh was going to go back to work and it was just going to be us and I didn't know if I could do it. I didn't want to tell anyone how I felt, because I didn't want to hear, "oh, you'll be fine! Don't worry!" How do you know i'll be fine and don't tell me not to worry. I had thought that my friends back home would call to see how I was doing or ask if they could bring dinner when we got back or just sit with me if I need them, even offer to take me out of the house. That never happened. It was pretty sad. I totally thought I had more friends here in Vegas. The ones that reached out were all from afar. I can't dwell on it anymore but I also can't forget about it either. 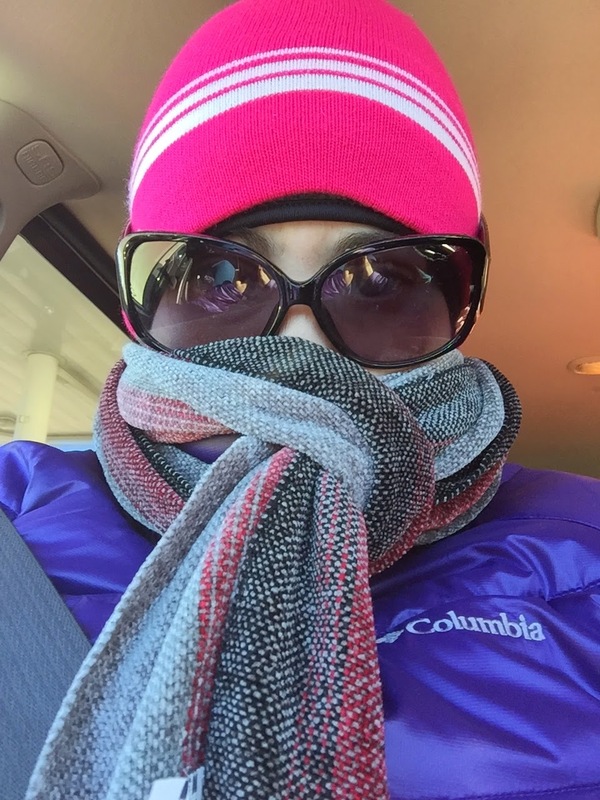 It was time to get back to reality and get out of this cold! We went from 23* in SLC to 63* in Las Vegas! Bring on the warmth! It was going to be hard to keep Hailey occupied and out of school for a few weeks. We always found things to do but Hailey wasn't walking from her ataxic episode and she couldn't use her arm so it was lots of iPad and movies and snuggles. Oh and a conference call with her uncle Adam. 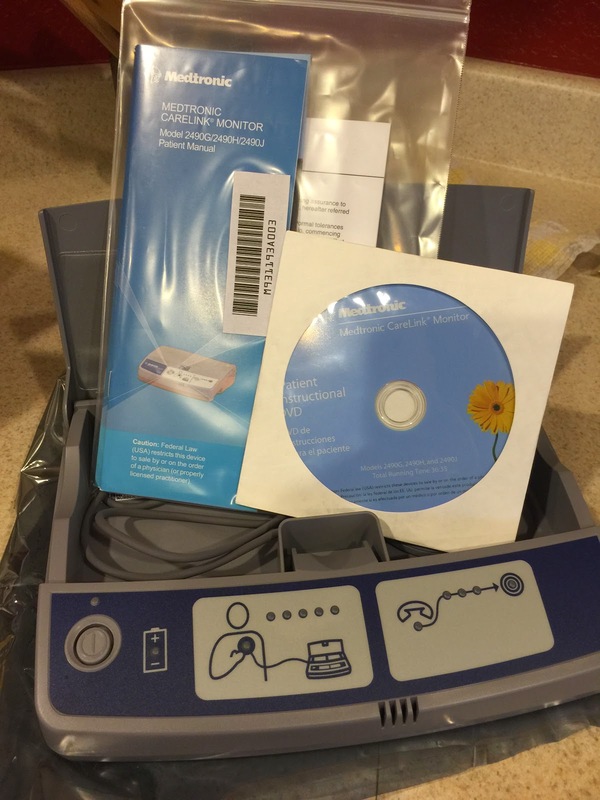 I ended up getting the machine that I'll be using to transmit Hailey's pacemaker information in the mail. I still don't know how to use it because no one told me when I needed to do a transmission. We go back to her cardiologist in March so I'm sure they will tell me then. The one bummer about this machine is that you need a land line, which we don't have....I'm working on that! Hailey is healing so well! She was never in pain. It was more of a discomfort. She never needed more then Motrin. She has begun to bare weight and take steps again!! I hover over her because falling is always an issue. She has until March 19th to not pull or push or lift with her left arm and I think I remind her of that 20 times a day. LOL! The one thing you tell her not to do is the ONE things she must do! She saw her scar in the mirror the other day and asked if she was all better yet. I told her, "yep! all better!" She didn't like her scar but it's just another part of the story. I read that scars tells stories. She is smiling and she is happy. I know I'm repeating myself when I say, we want to thank everyone for following along on Facebook and posting comments and well wishes for Hailey. I want to thank all the other moms that left me messages and emailed me. All the wonderful care packages were very much appreciated. It momentarily took away from the stress of wondering or even fathoming how much this is going to cost or how we will pay for it. I think about it and I worry. We are still going to try and make this year a great one for Hailey. We know it started out rough but it's only February. Once we are done with what seems like weekly doctor appointments and 2 more trips to Utah before April we need to do something as a family away from hospitals and doctors. Hailey's 7th birthday is coming up in May and she has been talking about it non stop. Every few minutes she'll say, "when I'm sebin..." (she can't do letter V sounds) it's pretty cute. We started back at Therapy and the grandest of all is that Hailey was released to go back to school! Oh happy day. Hailey loves school. The worry I have that I'm not there will never go away though. So that's the story. The one thing I want to add if you didn't catch it was that the whole time we were at the hospital not once did a neurologist come in to tell us the results of Hailey's MRI. Our cardiologist said that all she read was that Hailey's disease was progressing (which I think we knew) I'm currently working with Hunters Hope to see if they have a neurologist willing to look over Hailey's MRIs and offer insight. More on that later.